I have been trying to live more responsibly for almost 40 years. I have not been as successful in that quest as I would like. Yet, I know it’s a task to which we all need to more fully committed. Our planet has a finite amount of resources. As a person of faith I need to be a good steward of those resources. That means using less of those resources whenever possible, always being less wasteful, and recognizing that our world is home to far more folks than those here in my country. That means I need to share what I so often take for granted. A large part of my struggle to live more simply comes from being immersed in a society that seems to live to consume, rather than consume to live. Capitalism, Consumerism, and Wastefulness has become our new trinity. The words of E.F. Shumacher come to mind. Our current lifestyle of over-consumption and wastefulness is not only a peril to the peace of the world; it’s a peril to the survival of the world. Name a thing immoral or ugly, soul-destroying or a degradation of man, a peril to the peace of the world or to the well-being of future generations; as long as you have not shown it to be “uneconomic” you have not really questioned its right to exist, grow and prosper. This entry was posted in Hunger & Poverty, News & Views, Quotes, Uncategorized and tagged consumerism. capitalism, degradation, E. F. Shumacher, economics, immorality, peace, resources, responsible lifestyles, sharing, stewardship, wastefulness on January 30, 2015 by Ray Buchanan. Allowing children to die from hunger is child abuse. It’s murder, pure and simple. Let’s not kid ourselves. There’s enough food for everyone in the world. Yet our greed, over-consumption, and wastefulness condemns thousands of children to slowly suffer and die every day from hunger and malnutrition. The murder of millions of children is still murder. Make no mistake. It’s child abuse on a global scale, and it is still a crime. Don’t bother trying on the glove. It fits us all. 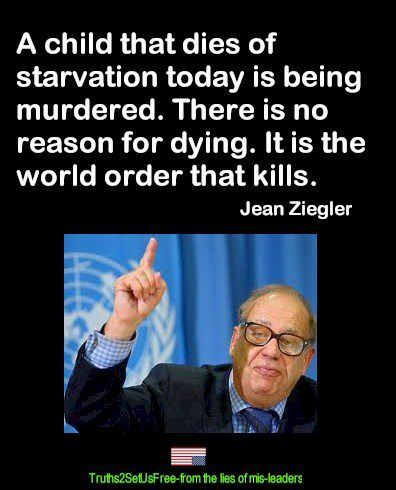 This entry was posted in Hunger & Poverty, Quotes and tagged child abuse, children, crime, death, glove, greed, hunger, Jean Ziegler, malnutrition, murder, over-consumption, starvation, wastefulness, world order on January 28, 2015 by Ray Buchanan. Today is yet another perfect day that You have made for us. Thank you for such a glorious creation. Help us take the time to properly appreciate the beauty that surrounds us and the perfection of the world You have formed. Forgive us for the brazen contempt with which we treat such magnificence and splendor. Forgive us for our lack of caring and our refusal to be good stewards of this gift that sustains the entire human family. Forgive us for our willful wastefulness. Open our eyes that we might see the world as a home that we are wantonly destroying. Grant us the grace necessary to pull our family together. Help us treat one another with the same love and respect we all seek and deserve. Allow us to fully comprehend that we are all connected, that all creation is one. This entry was posted in Prayers, Spirituality & Religious Writings and tagged creation, destruction, home, house, human family, planet, prayer, stewardship, wastefulness, world on November 16, 2014 by ray.